Keeping with our July – The Time for Bubbles theme, we’re doing a sparkling from the region of Champagne, France, and we’ve picked one that is moderately priced, as far as champagne’s go, anyway. The Champagne Victoire Brut Prestige in an absolute true golden colour, making the bubbles in your glass look like little jewelled trinkets. On the nose, you get a compelling sharpness and notice a strong aged grape scent, coupled with a light mineral undertone. All in all, from the colour to the scent, the strength of this champagne starts to become clear, even before your fist sip. On the palate, you will be pleased once more. In the mouth, you still pick up the fruity wine base, but the nicely balanced acidity and traditional carbonation, smooths out your experience. Lucky for us, each sip of the Victoire Brut Prestige, lingers for what we’d class as a medium to long finish. 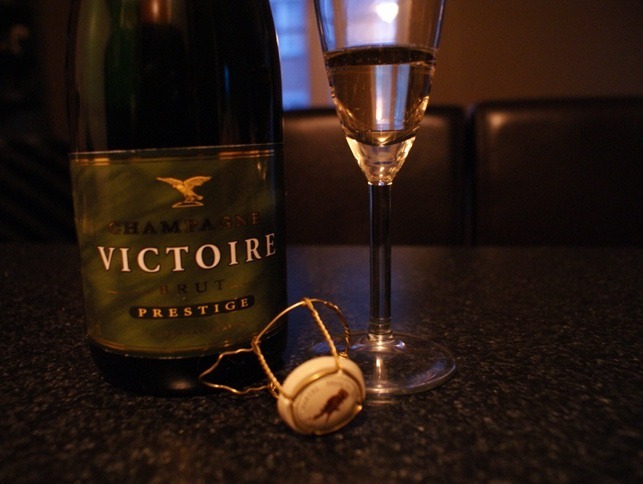 Champagne Victoire Brut Prestige is a champagne I would recommend for any occasion. It’s depth and breadth in makeup, coupled with balanced acidity and fruit taste, makes this a champagne that would please many.